Nike Zoom Pegasus Turbo are neutral performance running shoes. It seems that new Nike Zoom Pegasus Turbo was born after some comments from Kipchoge asking for a "daily trainer" (remember Kipchoge is an elite athlete) similar to impressive Vaporfly Elite so he can get used to particular dynamic. From the commercial point of view the Zoom Vaporfly 4% is rarely for sale (there is a custom website to get notified when they are available again) so regular runners must point to its "poor sister" Zoom Fly without hyped foam ZoomX but with specific full-length, carbon-infused nylon plate for improved response. As a summary, new Zoom Pegasus Turbo is a versatile running shoe for neutral runners featuring most innovatives foams (ZoomX and React) from the american brand where retail price is even higher than expected. Although new Zoom Pegasus Turbo is a completely new model, it takes some inspiration from successful Air Zoom Pegasus 35 that may lead to confusion, mostly because of well known Pegasus keyword in official brand name and limited similarities like innovative beveled heel. Upper is based on really breathable and lightweight dual layer FlyMesh with FlyWire cables which embrace midfoot for secure and snug fit. 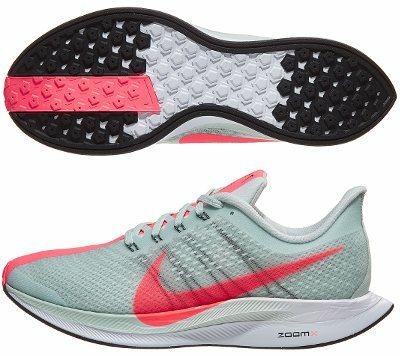 In a similar way the Air Zoom Pegasus 35 does, partly gusseted tongue provides sock-like (bootie) feel and heel collar has been extended up to improve Achilles protection. The most interesting part in Nike Zoom Pegasus Turbo is definitely the impressive midsole which keeps the classical 10 mm drop from Pegasus saga but changes what Nike has offered so far in commercial running shoes: two new technologies at the same time!. Two layered midsole is made of reliable and bouncier ZoomX on top of full length and softer React foam (already premiered in eye-candy Epic React Flyknit). As usual after all big marketing campaigns, it is mandatory to wait for unbiased feedback from regular runners (those who shop at full retail price) to know how it really performs. Regarding outsole, Nike gets rid of prominent Crash Rail on the external side and a narrower one in available along the border. There are no flex grooves present and typical Pegasus lugs (waffles) are distributed throughout the whole outsole.